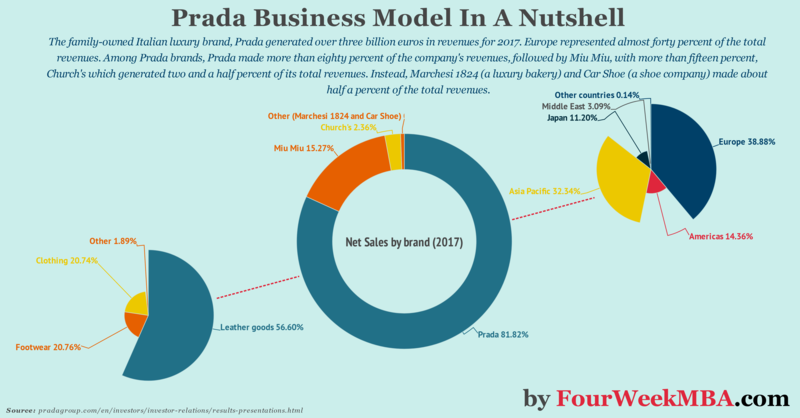 The family-owned Italian luxury brand – Prada – generated over three billion euros in revenues for 2017. Europe represented almost forty percent of the total revenues. Among Prada brands, Prada made more than eighty percent of the company’s revenues, followed by Miu Miu, with more than fifteen percent, Church’s which generated two and a half percent of its total revenues. Instead, Marchesi 1824 (a luxury bakery) and Car Shoe (a shoe company) made about half a percent of the total revenues. Among its products lines, leather good represented more than fifty-six percent of the total Prada revenues. Followed by Footwear and Clothing. More than eighty percent of Prada revenues got generated via its directly operated stores. Miuccia Prada owns sixty-five percent of Prada Holding, while Patrizio Bertelli owns thirty-five percent. Prada holding owns eighty-percent of Prada. In 1913 Mario Prada opened a store in the exclusive location of the Galleria Vittorio Emanuele II, in Milan. He sold mostly handbags, travel trunks, beauty cases, jewelry, and a few other, other luxury items. Prada boutique rapidly became the favorite of the aristocracy and bourgeoisie in Europe. In 1919 Prada also became an official supplier to the Italian royal family. That made the Prada brand as one of the most exclusive at the time. Bertelli started his entrepreneurial journey as a teenager, primarily making and selling bags and belts. When he was 20, he had already three people working for him. After years of gaining experience in the shoes and leather goods, he sold them under the names Sir Robert and Granello. Already in 1967, when Patrizio Bertelli was just twenty-one he had acquired in 1967 Sir Robert e in 1973 the Italian company Granello until he consolidated them under the name of Ipi. The real turning point for both Prada and Bertelli came when he met Miuccia. Bertelli was selling fashion goods that resembled Prada design. But as the story goes, the design was so good that eventually, Miuccia Prada licensed the production of her bags him. Eight years after that weird first encounter at the Bertelli stall, Miuccia Prada and Patrizio Bertelli got married. The two groups merged within Prada Holding, and that is how Prada expansion started. While Patrizio Bertelli focused on the innovation of Prada business model; Miuccia Prada focused on the innovation of its products. Bertelli relentlessly concentrated on gaining entire control over all processes, from creation to retail. Miuccia Prada’s talent focused on creating innovative products that got the attention of a global audience. The year that represented Prada expansion was 1983 when Prada opened up a second store in the Milan main street for shopping. While around the and of the 80s Prada started an internationalization process by opening stores in New York, and Madrid followed by London, Paris, and Tokyo. In 1993 Miuccia Prada created a new brand, Miu Miu, as sophisticated, stylish women brand. Miu Miu today is a critical contributor to Prada both in terms of financials and branding. In 1998-9, the luxury industry lived a strange moment. Back then Patrizio Bertelli seemed to have foreseen the future. After he had acquired a good chunk of Gucci shares, that resembled an unusual move. Gucci was a rival of Prada. Thus, the central assumption is that Bertelli was looking for synergies or ways to make Prada and Gucci come together. The paradox is that at the time Prada was smaller than Gucci and it costed $260 million, which was way more than Prada could afford. In that period Gucci was not just under the radar of Prada, but it was under the radar of other two giants that were looking to consolidate their empires and become the greatest global holdings in the luxury industry: LVMH and Kering. Prada who had acquired the shares of Gucci eventually sold them to LVMH. LVMH came in to take over Gucci. However, the fight had just started. The second luxury magnate in France – after Bernard Arnault – Mr. Pinault organized a consortium to take over Gucci. This consortium came to “rescue” Gucci, which called them up as an attempt to save the brand from the hostile take over of LVMH. The war ended in September 2001, when LVMH agreed to sell its shares in Gucci to PPR. Subsequently, LVMH acquired Fendi. This is how the consolidation in the fashion luxury industry ended up, and it all started from Patrizio Bertelli acquisition of Gucci shares! In 1999, the Prada Group acquired Church’s, founded in 1873 in Northampton, England. Specialized in high-end, handcrafted footwear. Church’s was a recognized symbol of British tradition and elegance. Prada also started to build its “Epicenter” store, first opened up in New York City. The purpose was to redefine the shopping concept. Tokyo and Rodeo Drive followed in 2004. Prada also continued its acquisitions with Car Shoe, a classic Italian brand famous for its exclusive driving moccasins. In 2003, Prada licensed its eyewear manufacturing to Luxottica, the Italian vertically-integrated global leader in the eyewear industry. In 2011, Prada listed on the Hong Kong Stock Exchange. In 2014, Prada acquired control of Angelo Marchesi S.r.l., a historical Milanese patisserie founded in 1824. In 2017 the Prada e-commerce platform was launched in China. This step was critical as it represented the consolidation of the company’s digitalization process. Thorough observation and curiosity for the world around us have always been at the heart of the creativity and modernity of the Prada Group. In society, and thus in fashion, which is somehow a reflection of it, the only constant is change. The transformation and innovation of references, at the core of any evolution, led us to interact with different cultural disciplines, at times apparently far from our own, allowing us to capture and anticipate the spirit of the times. Today this is no longer enough: we must be the actors of change, with the flexibility required to translate the demands of the market and the society into tangible actions that inform our way to do business. While Miuccia Prada is by definition the innovator of the two. Bertelli is famous for being an observer of contemporary lifestyle trends, which he uses to understand how to capture the spirit of the times in Prada collections. Created in 1993 from Miuccia Prada’s, Miu Miu is a way for Miuccia to keep giving the best of her creative and unconventional spirit to the overall brand. Church’s is a handcrafted shoemaker which tradition dates back to 1675. The first factory opened in 1873. Over time, Church’s fits well into Prada overall strategy as a popular luxury footwear company. Pasticceria Marchesi founded in 1824 embodied and embodies the Milanese style when it comes to artisanal taste. Since the start, Bertelli was obsessed with control. Prada had to be able to control each stage of the process. From creativity to manufacturing, distribution and the retail experience. Prada business model goes from the creative process to the selection of raw materials, the sourcing, and production, up to the distribution. This implies an integrated business model that follows each step, from creation to retail to keep the quality of the products as high as possible, while being able to control the customer journey via its directly operated stores, which represent most of Prada revenues. This business model proved effective and critical for Prada growth across the globe. That also requires vast resources. In fact, in 2017 Prada spent almost a billion and a half euros in selling costs. When you decide to control the whole chain, you either give up a part of the revenues, or you create an infrastructure that distributes the product. None of those choices is inexpensive, yet the latter also implies more control of the brand, pricing, customer experience among others. The retail channel generated 81% of the Prada Group’s consolidated sales while the wholesale channel accounted for the remaining 19%. Prada generated over three billion euros in revenues for 2017. Europe represented almost forty percent of the total revenues, followed by the Asia Pacific and the Americas. Among Prada brands, Prada generated more than eighty percent of the company’s revenues, followed by Miu Miu, with more than fifteen percent, while Church’s made almost two and a half percent of its total revenues. Instead, Marchesi 1824 and Car Shoe generated about half a percent of the total revenues. Among its products line, leather good represented more than fifty-six percent of the total Prada revenues. Followed by Footwear and Clothing. More than eighty percent of Prada revenues got generated via its directly operated stores. Via a series of corporations Patrizio Bertelli and Miuccia Prada combined own eighty percent of Prada Holding S.p.A. the company that controls PRADA S.p.A. It is interesting to notice that Miuccia Prada holds a majority of the stake, with a sixty-five percent of Prada Holding, compared to Patrizio Bertelli thirty-five percent of the holding company. This makes of Prada a family business.